Which Retailers & Products had the Merriest Christmas with Shoppers? Retailers must be feeling pretty jolly right about now. According to a Mastercard SpendingPulse survey, holiday spending rose a whopping 4.9% this year, the largest spike dating back to 2011. But as businesses seek closure on the historic 2017 holiday shopping season, some important questions remain: For example, which retailers and product categories had the best Christmas? On December 27, Field Agent surveyed 2,150 holiday shoppers* to understand (1) where they purchased gifts, (2) how they purchased gifts, and (3) what gifts they purchased during the 2017 holiday shopping season. *All respondents were U.S. adults at least 18 years of age who purchased gifts for others during the 2017 holiday season. All surveys were conducted through the Field Agent mobile app. Gender: 67% female; 33% male. Age: 18-24 (6%), 25-34 (32%), 35-44 (34%), 45-54 (19%), 55-64 (8%), 65+ (1%). Below we offer the results from this mobile survey. 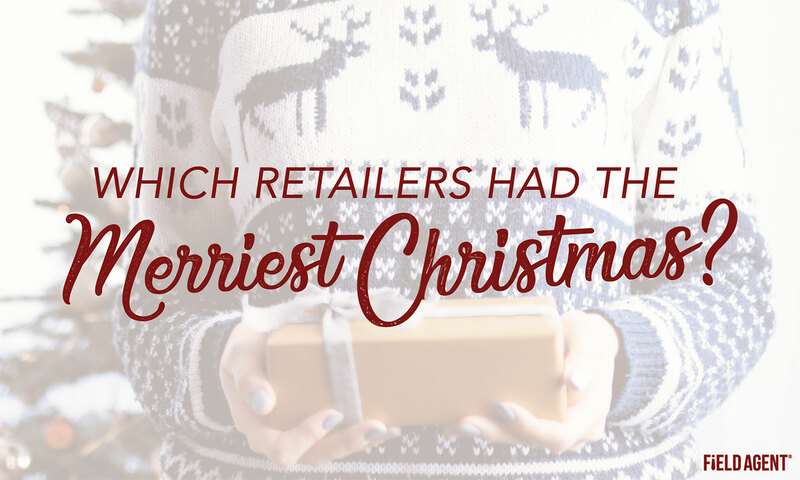 Which Retailers & Product Categories had the Merriest Christmas with Shoppers? 1. 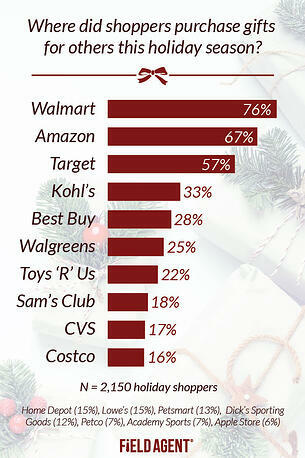 From which retailers did shoppers purchase gifts this holiday season? In our survey of 2,150 holiday shoppers, more said they purchased gifts at Walmart (76%) than any other retailer, with Amazon (67%) and Target (57%) finishing second and third, respectively. Note: For this question, respondents could choose multiple retailers. 2. With which ONE retailer did shoppers spend the most money on gift purchases this year? Here, Amazon and Walmart were practically tied. Some 30% of holiday shoppers in our survey said they spent more money on gift purchases with Amazon, and 29% with Walmart, than any other retailer. Other noteworthy finishes included Target (11%), Best Buy (5%), and Kohl’s (5%). 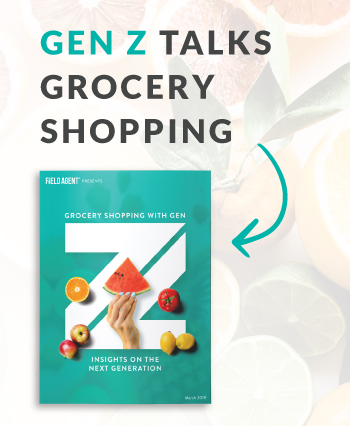 No other retailer amassed more than 2% for this question. Note: For this question, respondents could choose only one retailer. 3. How did shoppers purchase gifts this holiday season? Traditional, in-store shopping (79%) was the most common means by which shoppers purchased gifts during the 2017 holiday season. Yet online shopping was also very prevalent this year. In all, 73% of survey respondents—all smartphone owners—said they made gift purchases online, for home delivery and/or in-store pickup. The graph breaks out online purchases by home delivery and in-store pickup. 4. Through which ONE channel did shoppers spend the most money on gift purchases this year? At 50% and 47%, respectively, shoppers said they spent more money online than they did in stores this holiday season. However, this online shopping figure also includes in-store pickup, since such gift purchases originate online. Forty-three percent of respondents said they spent most of their money online for home delivery, compared to 7% who spent most of their money online for in-store pickup. 5. On which ONE product category did shoppers spend the most money this holiday season? 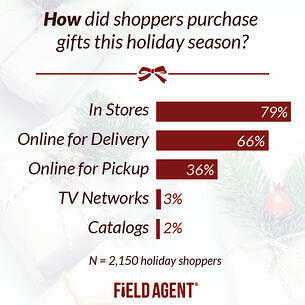 Finally, the Field Agent survey addressed the what of the holiday shopping season. That is, on which product categories—i.e., gift categories—did our sample of 2,150 holiday shoppers spend the most money this year? As the chart shows, toys (23%) were the overall winner in our survey, with electronics (20%) and attire (16%) making strong showings of their own. Need additional insights to make sense of the holiday shopping season? Based on more than 12,000 survey responses, Field Agent’s 2017 holiday report, An Old-Fashioned, Omnichannel Christmas, is packed with insights into holiday shoppers.